I have been meaning to write about sprawl for a while now and, as luck would have it, a recent article by Daniel Hertz at City Observatory provides a great introduction to explain how I see the topic. Mr. Hertz's article was a solid stab at an increasingly important question in America: how do you measure the cost of sprawl? His article studied commute times across the 50 major US metros and developed a formula for a 'sprawl tax' that is worth reading. He puts the cost at $107 billion a year, or about $1400 per commuter. That being said, I actually won't get into his particular approach, but rather I'll use it as a launching pad to the larger discussion about what I believe sprawl actually is, how it has happened, and to whom. This will hopefully show what I think to be the full cost of sprawl which the current measurements that I'm aware of, Mr. Hertz's included, fail to capture. For a general definition of sprawl, I turn to the one provided by Smart Growth America, which has been a leading researcher on sprawl. Their first report, published in 2002, defined sprawl as the process in which development across the landscape far outpaces population growth. They define four factors specifically to measure it: residential and employment density; neighborhood mix of homes, jobs, and services; strength of activity centers and downtowns; and accessibility of the street network. 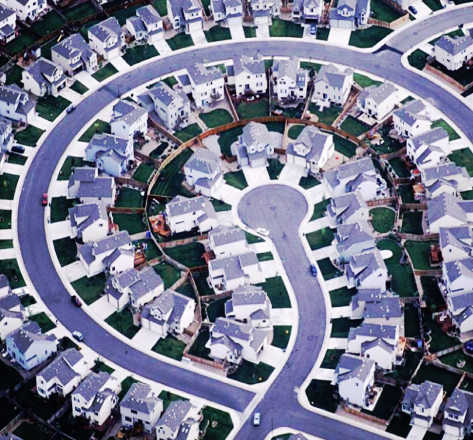 We are all familiar with this definition of sprawl: tracts of cookie cutter single-family homes, culs-de-sac (only a suburban kid would know the proper plural form! ), and strip malls are staples of the landscape. It's been a sub-genre of American art for over 50 years and at this point is cliche. We are also increasingly familiar with some of the costs of sprawl, particularly as it relates to how auto-dependent the majority of the country is. This is what Mr. Hertz has attempted to measure. We can measure these congestion costs because there are tangible data points to gather - we know how expensive gas is and how many hours we sit in our cars going to work. We are less certain about how to measure the environmental costs of sprawl because the number of variables and assumptions are obviously more complex than measuring gas consumption. Many anti-sprawl advocates also speak to the social costs of sprawl, but generally have not produced much compelling data behind it to date. Despite all of this, I think we still don't even come close to the true cost of sprawl because we only think it happens in the suburbs. As a result, we only attempt to measure it there. This is because the definition of sprawl from Smart Growth America (and the popular understanding of the term) fails to appreciate the larger economic and political forces that drive sprawl. If we expand the definition of sprawl to fully capture those forces, we can start to see how high the cost actually is. What's important to understand is that sprawl isn't an organic process. (Nothing in the built environment is organic.) It didn't just happen because millions of Americans suddenly wanted to live in the suburbs after WWII. It's not to say that Americans were 'tricked' into something that they didn't want, but they were absolutely steered towards certain economic decisions because they were no brainers for most families. However, it was also clear that only white Americans were being steered towards those decisions. Everyone else was being blocked. As a result, the more comprehensive way to describe the evolution of sprawl is that it was the outcome of various interconnected policy decisions that disproportionately rewarded capital investments in home construction and car manufacturing for certain corporations and for certain Americans; it also created a self-reinforcing effect of encouraging more capital (and more jobs) to relocate to the suburbs, again only benefiting certain Americans while leaving others behind. Looking at it this way, the physical nature of sprawl as we are familiar with it is really more of a by-product of those forces rather than the central feature. The central feature of sprawl was the coordinated political and economic policy of racial exclusion. Therefore, I think that a better definition of sprawl would be the process by which capital asserts a white supremacy over a pre-existing landscape. The pairing of 'white' and 'supremacy' might seem needlessly provocative to some people. I included the indefinite article 'a' just as purposely because, while I think it is impossible to look at sprawl without considering race, I also want to make it clear that I don't at all think it was the product of White Supremacy or some evil racial conspiracy. Nor do I think that everyone who designed the policies, executed them or partook in sprawl were racially prejudiced. But it is clear that sprawl was the product of a collection of conscious and subconscious prejudices that ultimately created a system of prejudice with horrific longterm consequences. We can see where my definition of sprawl still generally aligns with the traditional sense of the word in terms of the redevelopment of farmland into suburban housing tracts all over the US starting 70 years ago. The landscape wasn't 'developed' but it obviously existed and was owned and operated by someone (to be fair, probably a white farmer in many cases), albeit with less profit than development could earn. But we can also see where my definition of sprawl diverges from the traditional definition in some urban places like Brooklyn, Oakland, and DC. Over the last 20 years in these areas and others, many minority residents and homeowners have been pushed out or, more accurately, squeezed-in. We don't usually view these two scenarios as related, but they clearly are. We typically call the urban-form of sprawl something else: 'gentrification'. Viewing 'gentrification' separately from 'sprawl' misses the opportunity to look at the history of development in the US comprehensively and obscures the obvious link between capital investment and racial exclusion. To be clear, many people have written and studied this link, so I'm not trying to say this is a new observation. Gentrification is itself a highly complex topic, as I have discussed in previous blog posts. In those discussions, I've used the definition provided by the Furman Center which calls it the process of rapid rent increase in low-income neighborhoods over the last 20 years. As the Furman Center's report shows, some existing residents do benefit from gentrification, some are forced out, many just remain while their costs slowly increase. It can be a very loaded term (and I'm not suggesting we toss it out altogether) but as complex as it is, it fits very easily into the story of sprawl. Economically speaking, there really isn't much of a difference between building Levittown on green farmland on Long Island in the 1940s and flipping brownstones in Brooklyn in the 2010s. The relative amount of capital it took to invest in each was wildly different of course, but the return on each investment was similarly high enough to warrant both. They were both high margin opportunities. Levittown is considered the birthplace of American sprawl and the model for owning an affordable home in the suburbs. Houses were under $10,000 and many working class families could afford that. But it was also a crazy cash cow given the low costs of land and construction (and how the Federal government further subsidized it by constructing highways to it). William Levitt, who built Levittown and over 160,000 homes all told, became one of the richest men in America by the late 1960s with an estimated fortune of over $100 million at the time. He may have tapped into the mythical American Dream and helped create, or at least popularize, a way of life for many Americans, but he did it because larger forces came together to encourage him to and because he could print money doing it. A person or, more likely, a company, can still make a lot of money in home construction today even after the Great Recession to be sure. There just aren't the same level of returns compared to past eras because the formula of buying cheap land near a city and building thousands of cheap, small homes isn't readily available (and isn't popular). If you have a decent chunk of capital and you're looking for a high-return opportunity now, buying property in booming urban centers like NYC is the better bet. Property values have gone up in some parts of NYC by over 100% in just the last 10 years and most of that explosive growth has been in 'gentrifying' neighborhoods. Capital goes where the returns are, and they are higher in gentrifying neighborhoods than the suburbs. It's also clear how both types of development were/are impacted by racial exclusion. Post-WWII sprawl was not intended for anyone but white Americans. Levitt prevented blacks from buying homes and even prevented whites from re-selling homes to blacks. (Levitt, a Jewish man, also prevented Jews from buying homes.) Though this was entirely legal for decades, his policy was almost unnecessary given how hard it was for black Americans to secure mortgages from the Federal Housing Administration. Red-lining has become a well-known, notorious policy from that era because it prevented hundreds of thousands of black families from participating in the home-owning boom, which was the primary source of wealth creation for middle-class Americans. As capital was flowing into the suburbs, it was drying up in the inner-city, trapping generations of minorities into neighborhoods that lacked economic and social opportunity. This is the true cost of sprawl. As much as measuring congestion costs and environmental costs matter and should be expanded, we must include the untold costs of decades of racial exclusion as well. They manifest in every conceivable part of our society. Whether it's the cost of the Drug War, the cost of our huge prison population, the crisis in public education, runaway income inequality - every time we discuss problems typically associated with urban America, we are discussing the costs of sprawl. Taken as a whole, that cost is overwhelming and heartbreaking. There is a tragic irony to the current generation of sprawl as it spreads to many inner-city neighborhoods. The very people sprawl left behind for decades are now feeling major pressure to survive in places that it willfully ignored but now values - while suffering the indignity of having new, white residents referred to as 'urban pioneers' in major publications. This has led to increased tension in many neighborhoods as existing residents aren't able to participate in the economic gains occurring around them. It has also led to another irony - the unprecedented growth of poverty in America's suburbs - a fact that would have simply been impossible to imagine 60 years ago - as many minorities are being priced out of major cities altogether. But, again, that is largely the point of sprawl. Until we acknowledge the true cost of sprawl and the singular role it has had in creating a highly divided, frankly still-segregated country, we can't begin to undo the damage or avoid the same mistakes. If sprawl is allowed to continue to shape-shift into an equally exclusive urban form, the same problems that it created - which dominated the urban landscape in the 20th century - will merely shape-shift into the suburban landscape. Not only is the suburban landscape's design woefully unprepared for this, but we would miss the more important opportunity to address fundamental questions of access and opportunity that we should demand of development in this country.